Many of you are familiar with the Cloud B Sleep Sheep and the Twilight Turtle. 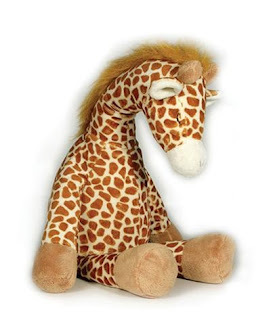 We would like to introduce their adorable Gentle Giraffe. The Giraffe is a noise machine equipped with four sounds similar to those that the Sleep Sheep makes. The soothing sounds help the baby soothe to sleep and also block out extraneous noise from the street or your household. The sound machine is housed in an adorable, furry giraffe so that your baby can have a friend too!